Worthing-based outfit stay in Renault UK Clio Cup title contention with silverware for BRDC Rising Star James Dorlin at the ‘Home of British Motorsport’. Misfortune the theme for team mate James Colburn after contact ruins opening race, with sibling Ben continuing solid development in rookie campaign. Championship fight concludes in a fortnight at the world-famous Brands Hatch on the Grand Prix layout [28-29 September]. 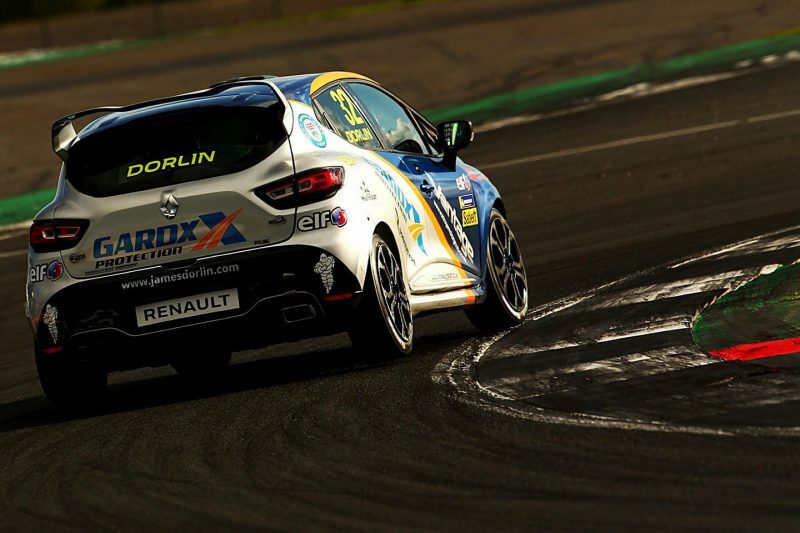 Westbourne Motorsport kept themselves in Renault UK Clio Cup title contention with a ninth podium of the 2018 season courtesy of James Dorlin at Silverstone last weekend. Starting on the second row for both races, Dorlin took a hard-fought fourth in the opening contest around the 1.6 mile National layout before claiming the runner-up spot in the finale, narrowly missing out on adding a sixth victory of the campaign for the Vantage Motor Group and GardX Protection-backed outfit to his tally. The net result of both races means Westbourne head to Brands Hatch in a fortnight within touching distance of a maiden UK Clio Cup crown, with just seven points blanketing the top three in the standings in one of the most competitive seasons on record. If not for a puncture after contact from another competitor in the opening race, and a harsh penalty for exceeding track limits in the second, team-mate James Colburn looked a fine bet to join Dorlin at the head of the field and replicate his past success at the ‘Home of British Motorsport’. Nevertheless, the 2011 championship runner-up and Terraclean-supported racer heads to Brands Hatch looking to repeat his podium success from the season opener back in April. Ben Colburn has taken the graduation to the UK’s closest-fought single make category in his stride and continued to make impressive steps at Silverstone. Traffic on his final qualifying effort left the Michelin Clio Cup Series ace frustrated, but he added more points to his tally nevertheless whilst keeping multiple ex-British Touring Car Championship racers at bay. The championship concludes in Kent across the weekend of 28-29 September. James Colburn (#7) said, “It’s been a frustrating weekend, all things considered. Straight line speed appeared to be our main deficit compared to the others, but fortunately the qualifying plan seemed to work well for James [Dorlin], which is crucial for the team and his championship effort; it’s just a shame things didn’t come together for me. James Dorlin (#32) said, “”It’s another good points haul and it’s always great to end the weekend on a high with a podium finish. Things are now looking pretty close heading to Brands Hatch in two weeks, and it’s all to play for. Ben Colburn (#55) said, “It’s been another interesting weekend, with plenty more lessons learnt. Qualifying was incredibly close and I was a little frustrated at being blocked on my fastest lap – it could have been good enough for P11, which just goes to show how closely matched things were around this circuit. Tagged Ben Colburn, James Colburn, James Dorlin, Renault UK Clio Cup. Bookmark the permalink.